2 blokes at my VMCC section have asked for info about V7s as they want something easier than their old stuff. The only thing I could advise was that they are good but are improved by disconnecting the Lambda sensors. What should I telling them? Which is the best mark? Any suggestions? So far I've had no trouble with my V7 Cafe, all sensors connected. These are the twin throttle body models same as V7 Classic. Compared to British twins I've owned its been delightful with a progressive step up. Depends on what the want to spend. The V7 III seems to be better than previous incarnations, but will come with a hefty price tag. I would go for a single TB engine - simpler to set up and my Breva with twin TB had a flat spot I could not get rid of. The MkI with 1TB does not have ABS while the MkII does.....personally the late MkI would be my preferred bike....which is why I have one! Don't disconnect the Lambdas - pull the main fuse (the big one) and reconnect it to clear the ECU tables (two tables, 'hot' and 'cold'), they have a tendency to learn bad habits; the tables will be rebuilt. The handbook says the spark plugs should be set to 0.7mm but the plugs come out of the box at 0.90mm and seem to work best at that gap. Before blaming the Lambdas, change the plugs and check the HT system. And the valve clearances may need resetting. The III has a USB socket but it doesn't get a tachometer. On the II a diy USB connects to the obsolete Tom Tom socket. 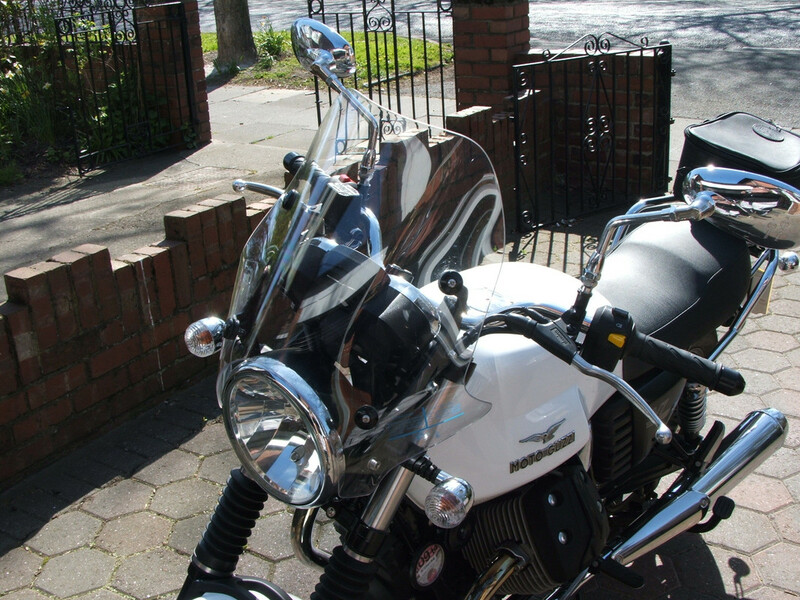 The III is Guzzi Multimedia platform ready but the app is a bit of a chocolate teapot; for example I know the where the maximum lean angle is when my toe touches the tarmac. You are right about the power characteristics of the mkiii compared to the mkii. Having ridden a mkiii, it just doesn't feel as 'punchy' as the mkii with a softer power and torque curve. It is a noticeable difference. They have sorted the fuelling on the Mkiii though to provide a smoother low rpm response to throttle input. After trying many fixes, disconnecting the lambdas worked with my mkii, but note this only works with the mkii, the others have different fuelling and don't seen to require it. Only the mkiii Stone and some of the kits based on it lose the tachometer. The mkiii special retains the twin clocks. It is only my opinion, but the mkii is the best looking. Other minor differences between the classic, mkii and mkiii exist such as footrest position, ABS & 6 speed box (mkii on) seat height etc. They all seem to be well regarded by owners (plastic fuel tanks aside on earlier models) so you pays your money and you takes your choice. There is some really good gen here, thanks very much chaps. Pardon my ignorance and I'm sure I am missing something really obvious but what is TB? Throttle Body. The bit with the butterfly in. Most of Guzzi's earlier models had one per cylinder, the later V7 range now have one between the two. When I said the V7 III seems to be better I was referring to the throttle response which had been mentioned just before. I took a v7 mark3 out for a test ride and it was very nice but it seemed to have more vibration through the rev range, but it was a new bike and may improve with more miles on the clock. My not very original v7 Classic gets smoother higher up the rev range you go. All that said, the latest model is probably a better bet simply because it's had more development. Thanks. And am I right in thinking that the Mk1 has carburettors? Not unless you are thinking of the original V7, the big block. If this is what you're looking at buy it immediately, even if it's on fire. Think of the V7 in waves. Anyone got a pic of the old one.